Thank you very much to the Scotch Malt Whisky Society of America for the opportunity to attend the Extravaganza as press. Since Minneapolis does not yet have a large-scale whisky show of their own (I say “yet” in hopes that one day…maybe…) I recently headed down to Chicago to attend the Scotch Malt Whisky Society of America’s Single Malt & Scotch Whisky Extravaganza. As you might guess, the Scotch Malt Whisky Society of America (SMWSA) is the U.S. branch of the Edinburgh-based Scotch Malt Whisky Society. The Extravaganza is their touring expo that showcases the world of Scotch whisky (both single malts and blends). 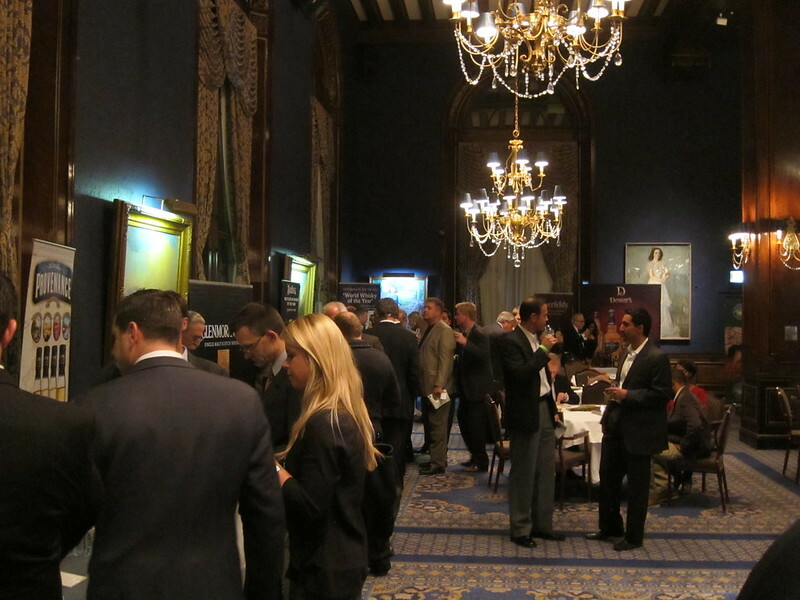 This year’s Chicago Extravaganza was held in the Loop’s Union League Club of Chicago, a non-partisan social club founded in 1879 and dedicated to furthering citizenship and cultural enrichment. The opulent main dining room with soaring ceilings and crystal chandeliers was easily one of the most luxurious settings for a whisky show that I’ve seen. Couple the room with the old school, brick & steel vibe that Chicago’s downtown still has, what with the L rumbling along overhead, and you’ve got a fine setting for a whisky-filled evening. Like the Extravaganzas (Extravaganzi?) I’ve attended in the past, I started the evening by attending the Whisky Panel. In lieu of master-classes and seminars, the SMSW Extravaganza series holds a panel discussion with industry experts before each show. On the dais in Chicago were: Ricky Crawford (SMWSA), Gregor Mina (Ardbeg & Glenmorangie), Stephanie Ridgway (Highland Park), Andy Hannah (Balblair), Peter Stasiulis (AnCnoc, Balblair, Old Pulteneny, & Speyburn), Kyle McHugh (Diageo Single Malts), Gabe Cardarella (Dewar’s & Aberfeldy), and David Allardice (Glenfiddich). As usual, the discussion was by turns serious and informative, and humorous and light-hearted. I always recommend attending the Whisky Panel, not only is it good to hear what these industry folks have to say, but you get a nice dram to start the evening off with and panel attendees are allowed to bypass the long line of ticket holders once the show begins. 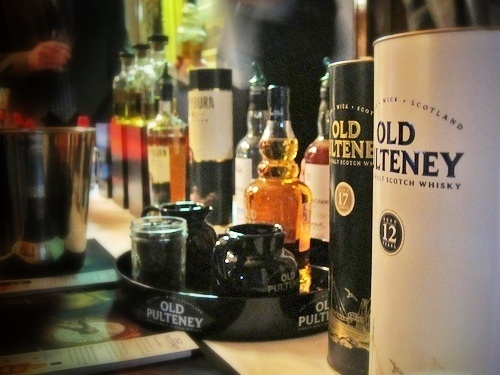 The Old Pulteney line-up, specifically the absolutely stellar 17 year old and the nearly-as-absolutely-stellar 21 year old. I’d love this distillery even if I hadn’t visited it in May, but having done so just makes me love their excellent whisky even more. I can’t recommend this rugged, complex, maritime-influenced, Highland dram enough. It doesn’t hurt that at the moment, it’s a pretty good value as well. Let’s hope it stays that way. Lagavulin Distiller’s Edition. For this year’s edition of this special edition, the already great 16 year old from this Islay stalwart has been finished in ex-PX sherry casks, giving it an added layer of lush sweetness and spice. Balvenie 17 Year Old. There’s been a lot of anticipation for this newly released Doublewood expression and from the taste that I had, I’m tempted to say it lives up to the hype…. Glenfiddich 21 Year Old. I was looking forward to trying this one as well as the Malt Master’s Edition. The latter was very good, similar to the 15 year old which I think I prefer more. The 21 year old, finished in a rum cask, was even better. Lots of Glenfiddich character with a bit more fruit and sweetness. The Scotch Malt Whisky Society of America Cask No. 93.47. This 9 year old bottling from Glen Scotia was a brash, youthful surprise. Lots of earthy, savory complexity, more than I usually think of from Glen Scotia. My least favorite thing about the show was the pair of “pour bunnies” at the Dewar’s table. I believe they were the only booth to have skimpily-clad women armed with just barely enough information to recite in the time it took to pour a taste in a glass. C’mon, why so tacky, Dewar’s? I’m not offended by this kind of thing, I just don’t quite get the rationale behind it. Sure, it’s a room primarily full of older men who might enjoy a bit of eye-candy, but it’s also whisky show focusing on the quality and elegance of the spirit. During the Whisky Panel, the Dewar’s ambassador made a good case for his brand and for the respect blends rightly deserve but in my opinion, having a couple of hired models who know nothing about the product does nothing for the brand except make it seem superficial and out of touch. Aside from the T&A vs. whisky battle being waged at Dewar’s, the Chicago SMSW Extravaganza was a great time. As I’ve mentioned before, I enjoy this particular show because of its more laid back pace and its narrower focus, Chicago was no exception. There was ample opportunity to speak with reps and ambassadors, ample space to step back out of the crowd to enjoy a dram, and a manageable number of whiskies on hand. 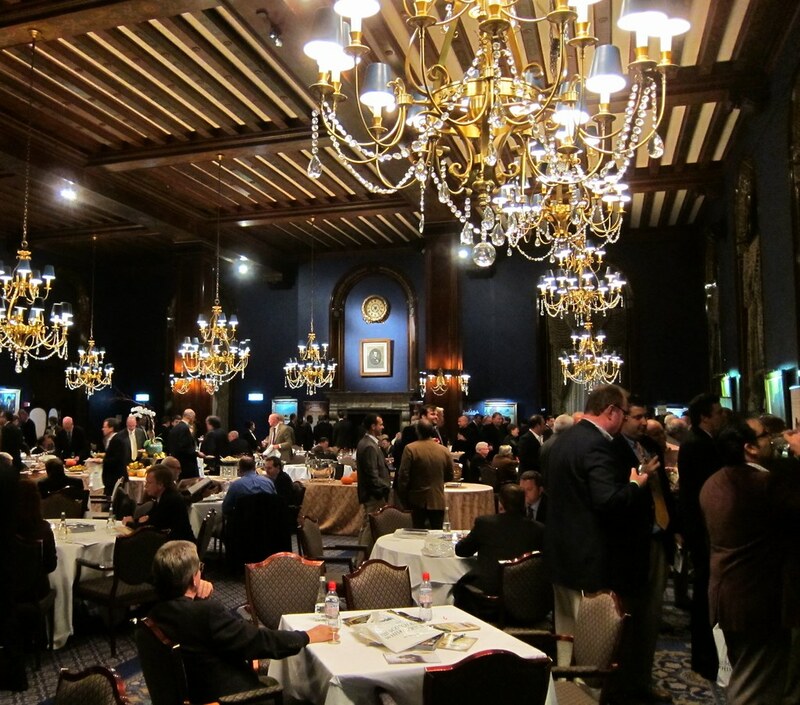 The Chicago show also had what was probably the best food of any large-scale whisky show I’ve attended, the Union Club kept a wide variety of excellent eats well stocked into the evening. All in all another fine event and evening from the folks at the Scotch Malt Whisky Society of America. Whether you’re just getting into Scotch or a grizzled malt veteran, I definitely recommend this event. For other Extravaganza tour dates and a discount code for the event, go…here. As much as I want to taste the Balvenie 17 Doublewood, it just seems like there are much more interesting malts you can buy at that price. I agree with you on the 17 year old Doublewood. I think it retails for around $120-$130 and that seems high for what will be a core expression.